The Select by Colour tool lets you quickly select all drawing parts painted or drawn with the colour you click in the Stage view. For tasks related to this tool, see Using the Select by Colour Tool. A mode for snapping the selected anchor point to any existing line. Guide lines are displayed temporarily to help you position the anchor point. A mode for rapidly selecting all artwork painted or drawn with the colour you click in the Stage view. This work on a single layer. 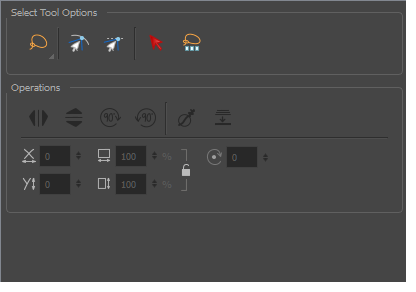 Selects all drawings in a scene on all layers.